I bought this Vessel sink about 8 years ago. It has held up wonderfully. Easy to clean. I absolutely love the whimsical design of the fish swimming in the bowl. I always get fun comments on it. Add breathtaking elegance to your bathroom decor with this stunning Fontaine glass vessel bathroom sink. 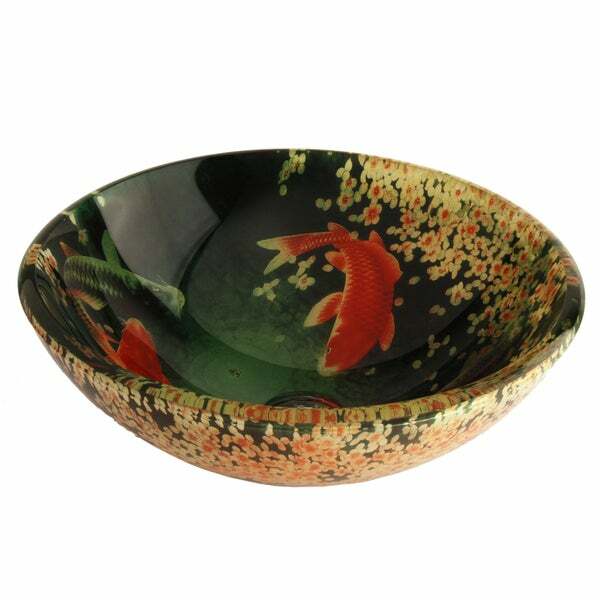 The round sink features a stunning koi and lily print, set between two layers of tempered glass that allow for a long-lasting, easy to clean design. The decorative sink provides a unique and artistic touch that will enhance the look of your bathroom. Minor variations in size and shape are to be expected due to production process. Dimensions provided are nominal and to be used for reference only. Do not rely upon dimensions provided to make any cuts. It is recommended that you receive the sink before cutting any surfaces. This sink is designed for flush mounting on flat surfaces. Deviations from recommended installations may void your warranty. Local building codes vary from state to state and even county to county. Company is not responsible for custom installation issues. This sink is stunning! I designed a new build bathroom around this sink. The colors are rich and the design is outstanding. Very heavy -- have no worries about durability. Sits on knotty hickory cabinet with counter of 1x1 recycled content glass tiles using mostly greens also pulling a few red/orange tiles which brings out the color of the koi. Other good accent colors are cream or pale yellow, black and apricot (reminds me of an orange-cream icecream bar). There are variances of greens--none of which are turquoise or seafoam. The greens are more like seaweed and range from pale green to dark green--very rich colors! Note that there is no blue in this sink--it may be difficult to tell from the picture.It really is beautiful! The accent tile in the bath contain 1x1 natural stone and glass tiles with muted shades of green and brownish green. The salesman at the plumbing store where our contractor had us go said we got a very good deal on the koi sink. He didn't show us a single sink for under $400 which is why I am looking for more sinks on Overstock.com! (also, our plumber approved the koi sink saying it looked very well made). I used a single chrome faucet--be sure to get one that is the right height for the sink--this sink also looks great with oil rubbed bronze! Good luck on your projects!! I just received my koi sink today & it is gorgeous! The sink is made out of very, very thick glass with a stunning koi scene. I read all of the reviews with the majority the buyers being very happy with their purchase before I made my purchase. Someone mentioned that the images in their sink were not clear but fuzzy. Mine is clear with very good detailing. Another buyer said that the sink was blue. It is definitely not blue but a dark forest green or emerald green. The colors are rich & deep & expensive looking. You will not be disappointed with this fabulous sink! The sink comes with a silver stopper which one buyer mentioned. She said that she purchased an antique bronze one instead. I agree with her & I plan on purchasing a antique deep gold or bronze stopper & faucet to go with the sink as it makes it look more expensive than the chrome one. I am moving in the future & this sink will go into a Japanese bathroom that I am planning along with a huge koi picture & a round wool rug with koi swimming in water that I already have for the room so the whole look will be stunning. This is my 6th purchase from Overstock & I have been extremely happy with all of my items & I am very particular & not always the easiest person to please. I would definitely recommend this gorgeous sink to anyone! Do not hesitate to purchase it. You will love it & so will everyone else!!! Bought this sink a year before starting our bathroom remodel. Chose our colors around the ivory color in the flowers. Installed easily with standard size pop up drain. I love that you can see the the design from any angle, even while sitting on the "throne" We installed an under sink LED light ring that makes this sink a perfect night light. Wow! Even more stunning. Thick, heavy glass sink is easy to clean. My husband likes it so much, that he wipes it out after every use. He never did that with the old sink, lol The print isn't perfect, but who cares. It's still looks like a work of art. Everyone comments on how beautiful our new sink is. 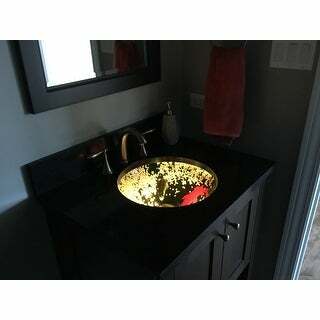 We have it centered on a 6 foot vanity, with a blac marble counter top, and antique bronze faucet. Stunning! I am so happy with this Fontaine Koi and Lily Pond Glass Vesses Bathroom Sink that I would recommend it to those who would like an Asian influence in their bathroom. The sink art has a sense of humor which is not imediately seen. Upon closer inspection you can see a fly in the scene that the Koi will never catch. Great Quality and appearance. The 1/2 inch thick glass with the picture in the glass not on the glass looks great! With the drain included, Installation was simple. It was in and running in no time at all. I love the looks and am sure that it will last for years It works (drains) great. Beautiful! and affordable! Installed on top of tropical green granite, with the mounting ring provided- looks much better than mounting directly on the counter with silicone. This was installed professionally; make sure the cutout holes are the correct size and not too big! Instructions provided are minimal for the first time DIY, so would recommend a professional installation. Water drainage is complete with the drain hardware provided, although it is not the best quality. You can always upgrade to a more expensive drain assembly. Make sure your faucet is a tall one for on-the-counter assembly, and also adjust your counter height as needed. Many compliments from all who've seen it! I just received this vessel sink and I was blowen away! The picture does not do it justice. It is much more beautiful. I can hardly wait to set it up in my bathroom. I was a little anxious when I read one review that said the color was more blue than green but mine looks exactly like the one advertised. One thing that I noticed was how thick the glass was it must be almost an inch think. I would highly recommend this product. We have a lily pond with koi, so when I found this sink last year, there was no question we would buy it. My only complaint is that the silver rim does not coordinate well with the colors -- gold, black, or brown would be much better, but I found a great faucet set in the right color family so problem solved. 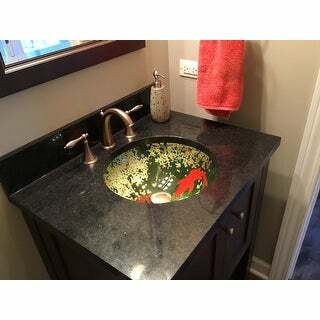 EVERYONE who has seen this sink has loved it -- it has vibrant colors, is a knockout, and is easy to clean. The art is between layers of glass so you don't have to worry about colors rubbing off or fading. GREAT sink -- highly recommended. This is a vessel sink that I had under mounted with lighting underneath. I love it. I had to send this back. I have been wanting this sink for at least 3 years. I was so disappointed when I opened the box. There was no shading, the fish were solid orange. There was no detail to the fish as there is in the picture. It looked at if someone cut out a fish shape from construction paper. The lilies were just while and orange, none of the light yellow shown in the picture. You could see the pixels in the picture of the fish. It's like a bad photo glued between 2 layers of glass. The sink was very heavy and of good quality. The glass was very thick, and I don't think it would have broken. I just wish it was as pretty as the picture representing it. This sink is beautiful! Very heavy and the design on both sides - inner and outer - of the sink really make it an outstanding addition to your bathroom. I have had so many nice comments on this sink and everyone is surprised at the price being so low. Great item! I was so excited when I found this vessel, and couldn't wait for it to arrive. When it came, however, I was very disappointed! It looked VERY cheap and the image in the glass was not crisp at all; it looked like a picture that was printed off of a regular computer printer--and one that was off track, at that (the lines were fuzzy, the overall image grainy). The other glowing reviews make me wonder if my item is defective or somehow different from theirs, as the bowl I received is NOT like the picture at all. It's dull and gritty looking, not near as classy or rich in color. I'm still debating on whether to send it back or not to see if I get a nicer one in return. I hope you all have better luck! However, I was expecting a LOT more from this bowl, so if you are okay with "average", then perhaps you won't be as upset when yours arrives. A Koi Pond without the work! This is a fun sink. We have just finished our bathroom remodel and everyone especially loves the sink. It is heavy duty and easy to install. My biggest problem was deciding where to place in on the vanity. Just received this and I am especially happy! This is gorgeous! It will be a great asset to our new guest bathroom, and this will be the the hilight of the room. It will have a dark bronze faucet and drain and a dark quartz countertop. This is going to POP! This is probably the very best sink I have ever owned... I love the bright colours. It is exactly as pictured. I bought bamboo taps to go with it and have had so many compliments on it. Stunning inside and out! I purchased two of them thinking I was going to put them in a new build home but purchased a home with sinks already installed, These are so pretty I'm trying to figure out how I can incorporate them in some kind of water feature!!! Made well did a Reno with it the tenants love it . It can be used in an antique setting, handsome setting , and contemporary setting. Fabulous sink! Ordered another to make our master bath sensational! Cannot wait for the install! Will be beautiful with the reeded sea glass mirrors above. This bowl is beautiful. It still needs to be installed but I am sure it will become a conversation piece. It appears to be of excellent quality. I can’t wait to use it. Beautiful and Elegant. Fits in stylishly with our simple Japanese style bathroom. Size is easy to use and doesn't create a splashing issue or an uncomfortable edge for your forearms to rest on. Doesn't look cheaply made and has great depth with natural sunlight. Arrived quickly and packaged with thoughtful care. "Is this product out of stock ?" HAVE ALREADY IN HOUSE I,M SELLING. GOING TO REPLACE IN NEW HOUSE. LOVE IT. "Could this sink be undermounted? I just don't want a vessel sink but I've loved this sink for a long time." Hello emmasaunt, unfortunately this item is out of stock. We currently do not have inventory to check, and cannot guarantee the item will be restocked. Thank you for shopping with us. "The spout height of the faucet I am considering is 8 inches and the reach is 4.8. Is that adequate for this vessel sink?" "The installation instruction sheet shows the drain size is 1.75 inches and a cushion-O and Base ring that are placed between the bottom of the sink and the countertop. Where can I get these items and know they will match? Are there any other items I'll need to install this vessel that are not mentioned?" "What size pop up drain does this require as I need to replace mine . IS it 1.5" 1.5/8" or 1.75" ??? Also where can I get the required washers ? thank you ." Hello julius2118, the drain size is 1.75 inches. You would be able to get the washers at your local hardware store. Have a great day! "The installation instruction sheet shows a cushion-O and Base ring that are placed between the bottom of the sink and the countertop. These items were not included. Do you sell these as separate items? Where on your website do I select/order them?" Hello furo1, thank you for your inquiry; you will be contacted by Customer Care. This product is not yet released, and is expected to ship on Feb. 13, 2006.